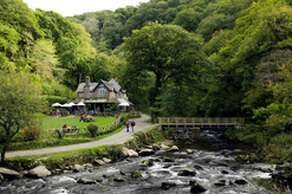 An easy 40 min walk from our front door, experience at first hand the varied Exmoor landscape of rocky coastline, heather moorland, wooded valleys and fast-flowing rivers. This dramatic stretch of the South West Coast Path features one of Britain's deepest river gorges. You will discover the perfect setting for an Edwardian tea-room and gardens - a haven for butterflies, otters, birds and salmon. Beyond Watersmeet there are Iron Age hill forts to explore at Countisbury and Myrtleberry. A good uphill start to your walking day. How the Valley of Rocks was formed even confuses the experts. Did a gigantic ice sheet 450,000 years ago deposit a massive amount of rock and rubble that dammed the East Lyn River and caused it to overflow through to Lee Bay? 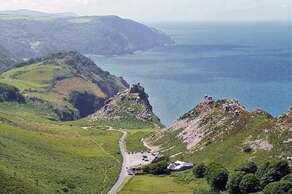 Or perhaps it was once the natural river system flowing out of Lee Bay until cliff erosion at Lynmouth allowed the waters of the East &West Lyn rivers to flow out to sea further up the coast, thereafter leaving the Valley of Rocks high &dry? 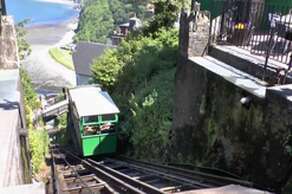 No family trip to the picturesque towns of Lynton and Lynmouth would be complete without a journey on the world famous Cliff Railway –it's the best and most exciting way to travel between these two historic towns, and will be one of the highlights of the day –for Mums, Dads and the Kids! Enjoy stunning views of the North Devon Coastline as you glide up and down the 862 foot length of track;from Lynmouth nestling at the foot of the cliffs to Lynton perched 500 feet above. If you are a rail enthusiast, or just looking for a good day out, there is a large group of enthusuasts who are hoping to re-open the old rail links along the coast. Some of the stations now have steam trains offering short trips - one of which is Woody Bay Station, on the road between Barbrook and Blackmoor Gate. Exmoor zoo is different from other zoos. It is not a wildlife park or a city zoo, but a more personal, friendly and contact orientated zoo which has grown into a North Devon Valley. This is reflected by the talks and encounter sessions (every half hour in the Summer), a visit will show you there is a lot more here than first meets the eye!